We often see roads in our dreams, and the experiences you have in dreams about a road can have a lot of meaning in your life. Understanding what this dream means can help you with your path in life. What Does it Mean to Dream About Roads? A road is often a sign of where we are headed in life and our current direction and path we are on. Dreams about roads are indicators of your current life path. Are you on the right track? Your overall mood in the dream and the tone of the setting will give you a lot of information. Did you feel confident and able to go anywhere? Or did you feel like you were lost or unable to stay on the right path? Roads can lead us to new opportunities - or they can lead us into trouble. Sometimes a road can be a symbol for temptations or the fear of missing out, especially if you are faced with choosing one road over another in a dream. If you are driving in a car in your dream, it is helpful to also look up the meaning of automobiles, cars, and other vehicles. Often times, driving or being a passenger in a car relates to how much in control you feel. 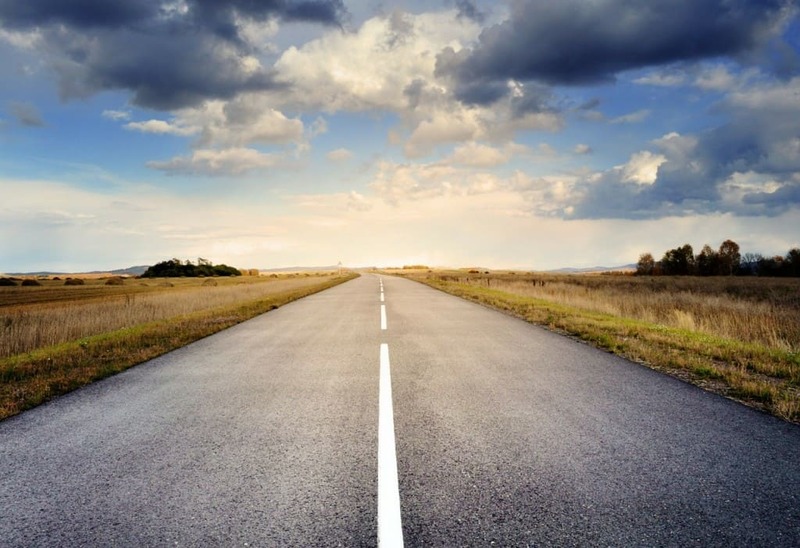 There are many different types of roadways in our physical lives - and naturally this means there are also many different types of roads and passage ways in our dreams! Was it a busy 6 lane highway? Or were you driving on a gravel country road in the middle of nowhere? Identifying the types of road you were on will help you understand more deeply into what the dream means. Busy City Highway: A busy highway that is hard to drive on can mean that you are on a very busy and fast paced path in life. You may have too many things coming at you at once and it is time to let some things go. This dream may be suggesting that you would like to slow down. Being stuck in traffic might mean you are aware of feeling like you need to make some changes, but are unsure of how to actually do them. The Open Road for Adventure: Do you see a wide open road like the one pictured above? This can mean you are seeking new opportunities. You may even see something promising in the distance, such as a brightly lit city. This can mean that you should pursue any new opportunities that are presented to you. Driving Into a Storm: If you see a storm ahead or a large mountain in the distance on the road, this could mean you are concerned about upcoming problems or that you do not have a very bright outlook for the future. You may have anxiety about an upcoming challenge in your life. Driving backwards: Driving in reverse on a road can mean one of two things. It can mean that you are affected by something that may have happened in the past, or it can mean that you are needing to go back and look at something that happened a little more carefully. Walking on a Road: Walking on a road symbolizes that you are looking for the right path for you to be on in your life. If you are walking with other cars speeding by, it could mean you are putting too much energy on comparing yourself to others. Street With Houses: If you dream of a street with many houses or perhaps a street in a city or town, it can be helpful to understand what houses mean in our dreams. Often times, a house represents ourselves, and so it may mean you are looking for where you belong in life. If the road is foggy and difficult to to navigate this indicates you may be lacking direction or security with your current life path. You may be feeling uncertain about where your life is headed. If the road is uneven, dark, or difficult to drive on, this could symbolize that you may need to make changes in your waking life to get back on the right path. When you dream of a road that is scary or spooky, it could mean you need to face and confront your fears in order to navigate through life easier. If the road is smooth and easy to navigate this portends to your ability to navigate through your life with ease and that you are currently on the right path. If there is a split in the path, this is typically symbolic of a life changing choice that you are considering or that you will need to make in the near future. Did you have a dream about being on a road? What do you think it meant? Share your thoughts and experiences in the comments section below.